To ensure that your PVR works as reliably as possible, we recommend that you make sure it has up to date firmware on it. Although there are occassional updates from Topfield themselves, not all are fully tested in the UK before release, and some of them will cause more problems than they solve. 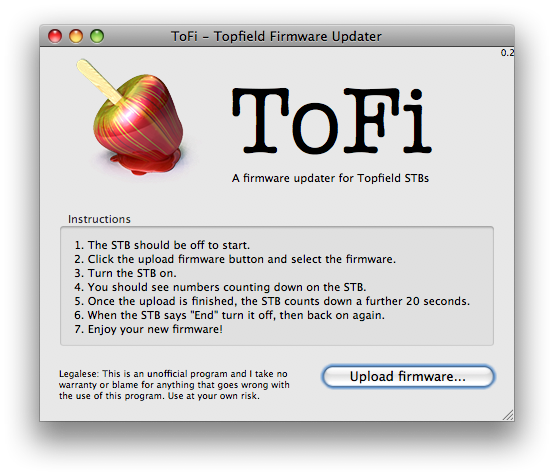 Some of the programmers who work on this site have put together the Toppy.org.uk recommended firmwares, which include the third party fixes for many issues that Topfield has yet to resolve. In particular, the firmwares available from this page all include the necessary fixes for channel scanning issues, otherwise known as “NITfix,” which are essential to ensure that channels appear on the correct numbers. You can use these firmwares safely on your PVR, and they will not invalidate your warranty. You can at any stage revert to an official Topfield firmware simply by installing it manually. We strongly urge that you use the Toppy.org.uk recommended firmware on your PVR. To find out which firmware version you are using at the moment, press Menu on the remote control, select Information, and then IRD status (or System Info on some versions). The firmware version is indicated by a line labelled either Application Version or Software Version, and the important information starts after the letters TF-NPT. The Toppy.org.uk recommended firmware version is 5.13.65T for a TF5800 or 5.15.09T for a TF5810. If the version shown on your PVR is not one of those, and does not have a version number ending with the letter T, then you should probably install one of the firmwares available from this page. The recommended firmware is updated from time to time; if the info screen on your PVR shows you have a recommended firmware installed, but the ‘Last Update’ date is earlier than — which is when our recommended firmwares were last updated — you may want to upgrade to the latest edition. However, there is one important caveat — if you have a TF5800 (old or new version) with a firmware version starting 5.14, please note that you will lose the built-in series recording facility if you change to our recommended firmware. You can achieve similar functionality by installing TAPs, and it will probably give better results, but we realise that some people prefer just to use built in functionality. If this is the case, we recommend that you use firmware 5.14.09T. What do you need to update your firmware? Updating your firmware is much simpler than you think. You need a computer with software to perform the update, a USB A to B cable — that’s the same sort used to link a PC to a printer - and the firmware file itself. The update can be performed automatically using our Firmware Loader tool, or manually; instructions for both methods are provided on this page. After the update, it is a good idea to perform a factory reset of your PVR, and rescan for new channels, though this is not necessary if you are moving from one Toppy.org.uk recommended firmware to a newer version of the same firmware. If you use a TF5800 and move from a 5.13.x firmware to a 5.14.x firmware, or in the other direction, a factory reset is essential to ensure correct operation of your PVR. Before starting, it helps to be certain which model Topfield PVR you have. If you are not sure, click here for help identifying it. If you don’t use any TAPs on your PVR, then you can continue to use it as normal after installing our recommended firmware. However, the firmwares available from this page, or via the Toppy Firmware Loader, do include functionality that has previously been incorporated in certain TAPs. So, if you have been using any of the TAPs listed below, you should remove them from your PVR (just delete them using Altair), as they will no longer be needed. Accurate Bookmark. This places bookmarks in each recording, at the point where the TV channel signals that the actual programme starts or ends. EITDupFix. This increases the reliability of the built in EPG gathering mechanism. MHEG State. This allows TAPs to determine the status of interactive services, like BBCi or Teletext. Description Extender. This allows compatible TAPs to display full information about programmes in the EPG, rather than just the first 128 letters. Remote Extender (5800 only). This allows compatible TAPs to keys on the remote control more flexibly. The easiest way to update firmware, if you are using Windows, is by using the Toppy.org.uk firmware loader, which will automatically fetch the latest recommended firmware from this site and install it on your PVR for you. (At present, you cannot update firmware from 64 bit versions of Windows Vista, as there is no compatible driver available). Mac and Linux users should scroll down the page for instructions. 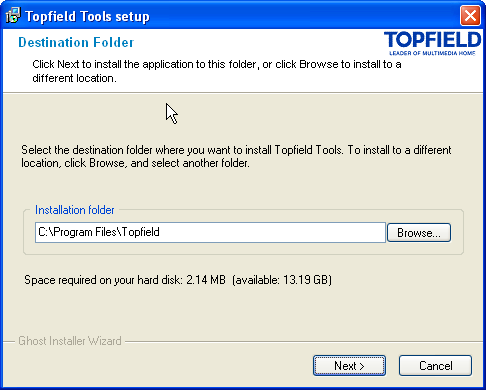 First, regardless of whether or not you are using the Toppy.org.uk firmware loader, you will need to install the Topfield Tools for Windows on your PC. Download the file here, or from Topfield’s UK site if you prefer. You will need to extract the contents from the zip file you have downloaded and the double click on the ‘Topfield Tools’ setup program. Do not connect your PVR to the PC at this stage. Just work through the setup routine, accepting the defaults. When it has finished, (or at any rate, before running the Toppy.org.uk firmware loader), you should connect the PC to the PVR using a USB cable. Windows should detect the PVR when it is turned on, and you should allow it to install the drivers automatically. You will only have to do this once. If the New Hardware Wizard does not run when you plug the PVR into the computer, then you should run it from the Control Panel, to ensure that the drivers are installed. Next, download the Toppy.org.uk firmware installer, available here. This too is a zip file, so you need to extract the contents. Make sure the PVR is turned on, and plugged into the PC, then double click on the file called ‘SetUp’ and follow the instructions on screen. You will be able to choose which version of the firmware you wish to install - the standard recommended firmware for your model, a version optimised for the MyStuff TAP, or (for TF5800 users) a version with the series record option built in. If you have a TF5810, you will have to manually turn your PVR off and then back on as part of the update process, so please read the instructions carefully. Other models will restart themselves automatically. The Toppy Firmware Loader program transfers new firmware to your PVR, and when it restarts, a program on the PVR will perform the actual update. Do not interrupt this process. TF5810 users should turn their PVR off when the Firmware Loader program tells them to, and then connect the PVR to a TV before turning it back on, so you can monitor the progress of the update. When you turn the PVR back on, it will start normally, then a blue screen will appear on the TV, with information about the progress of the update. This ends with a progress bar, showing the firmware being flashed onto the PVR's memory, and the message ‘closing down’ after which a TF5800 will restart itself automatically. On the TF5810, you will be returned to the live TV picture, and you can safely switch the PVR off again, as the firmware update is complete. If it is not convenient to connect it to a TV, we recommend that you wait at least five minutes for the update to complete, before switching the PVR off. The installer automatically restarts the TF5800, so users of those models can simply wait until the second restart - you will see the from panel display show either C.456 or C.458, followed by a channel number, once after the firmware is transferred to the PVR, and again after it has been installed in the PVR’s memory. You can safely switch off the PVR after the second reboot, and reconnect it to your television. Before downloading any of these files, please make sure you know exactly which model of PVR you have, as is not possible to install firmware on a model for which it is not intended. Click here for a quick guide. In all cases, you should end up with a file that ends with the extension .tfd, which needs to be transferred to the PVR. You cannot install directly from a Zip file. 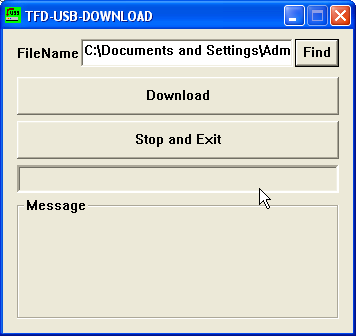 Windows users can update using the TFDN_USB application, found in the Topfield group on the Programs menu. Start the program, and click the Find button. Browse to the location where you downloaded the firmware you want to install, and double click on the file. You’ll be returned to the main window. Now, connect your PVR to the PC, and make sure it is in standby. Next, click the Download button in TFDN_USB and then press the power button on the front of the PVR. The front panel display will show the letters ‘dn’ followed by a countdown, which may repeat, then ‘AP’ followed by a countdown, and finally the message ‘End’. You may also see four flashing dots, on a TF5800. The firmware update has completed when you see the ‘End’ message. Mac users can use the ToFi tool to update the software on their PVR, as long as your Mac has USB 2.0 ports. Download it from our software library here. The downloadable file is a disk image; double-click to open it if it does not appear on your desktop automatically, and copy ToFi to your Applications folder. Connect the PVR to your Mac using a USB cable, and make sure it is turned off. You do not need to install any drivers or additional software. Launch ToFi and click on the Upload firmware button at the bottom right to locate the firmware file you wish to use to update the PVR. Select the file and click Open. You will be returned to the main ToFi window. The Uploade firmware button should be glowing blue. Wait a few seconds, and if the button changes, so that it is mostly clear with just a blue edge, click and choose the firmware again - this often happens if your PVR is running a firmware with the built-in series record option. When the firmware file has been chosen, and the Upload firmware button in ToFi is glowing blue, press the power button on the PVR. You will see a countdown on the PVR’s front panel, first preceded by the letters ‘dn’ (which may repeat) and then ‘AP’, before the message ‘End’ is shown. Your firmware has now been updated. Linux users will need to install ftpd-topfield on their computer; when this is installed and running, connecting to your computer by FTP will show you the files and folders on the Topfield PVR, via its USB connection. You can update the firmware by transferring the tfd file to the /Firmware folder. The home page for ftpd-topfield is here. If you would like to install an official Topfield firmware, you can find a list on the Firmware database page, with additional information and download links for many of them. For most users, however, we recommend that you use one of the firmwares listed on this page. To view this page without the menus, in a format suitable for printing, click here.